We all know that most MCUs we use for our projects are time-agnostic; simply put they are unaware of the time around them. 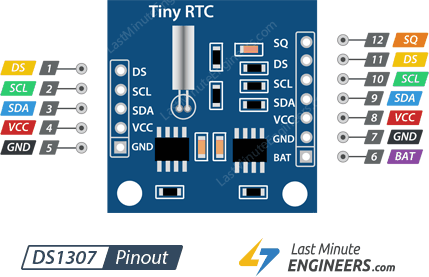 It’s OK for most of our projects but once in a while when you come across an idea where keeping time is a prime concern, DS1307 RTC module is a savior. It’s perfect for projects containing data-logging, clock-building, time stamping, timers and alarms. 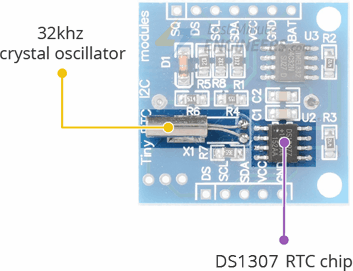 At the heart of the module is a low-cost, quite accurate RTC chip from Maxim – DS1307. It manages all timekeeping functions and features a simple two-wire I2C interface which can be easily interfaced with any microcontroller of your choice. The chip maintains seconds, minutes, hours, day, date, month, and year information. The date at the end of the month is automatically adjusted for months with fewer than 31 days, including corrections for leap year (valid up to 2100). The clock operates in either the 24-hour or 12-hour format with an AM/PM indicator. The other cool feature of this board comes with SQW pin, which outputs one of four square-wave frequencies 1Hz, 4kHz, 8kHz or 32kHz and can be enabled programmatically. DS1307 come with an external 32kHz crystal for time-keeping. The problem with these crystals is that external temperature can affect their oscillation frequency. This change in frequency is negligible but it surely adds up. This may sound like a problem, but it’s not. It actually results with the clock being off by around five or so minutes per month. The DS1307 incorporates a battery input, and maintains accurate timekeeping when main power to the device is interrupted. The built-in power-sense circuit continuously monitors the status of VCC to detect power failures and automatically switches to the backup supply. So, you need not worry about power outages, your MCU can still keep track of time. The bottom side of the board holds a battery holder for 20mm 3V lithium coincells. Any CR2032 battery can fit well. 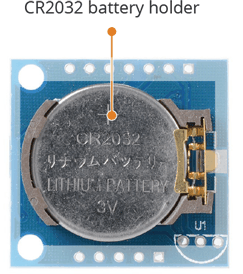 Assuming a fully charged CR2032 battery with capacity 47mAh is used and chip consumes its minimum 300nA, the battey can keep the RTC running for a minimum of 17.87 years without an external 5V power supply. DS1307 RTC module also comes with a 32 bytes 24C32 EEPROM chip from Atmel having limited read-write cycles. It can be used to save settings or really anything. 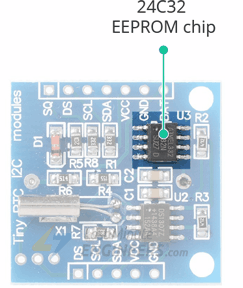 The 24C32 EEPROM uses I2C interface for communication and shares the same I2C bus as DS1307. Code for reading/writing onboard 24C32 EEPROM is given at the end of the tutorial. There’s a provision on our DS1307 RTC module that often goes unnoticed. It allows us to install DS18B20 temperature sensor. The 3 holes in the top corner right next to the battery holder(labled as U1) is where the DS18B20 is installed. 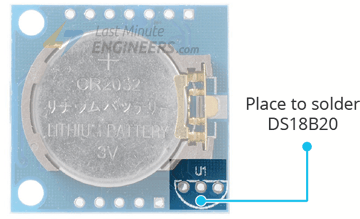 Once you install the DS18B20, you will be able to get temperature readings from DS pin. These readings can further be used to compensate for temperature based time drift in code. Follow the silk-screen to solder DS18B20. You might also need a 4.7K resistor between VCC and DS. SQW pin outputs one of four square-wave frequencies 1Hz, 4kHz, 8kHz or 32kHz and can be enabled programmatically. DS pin is supposed output temperature readings if your module has a DS18B20 temperature sensor installed right next to the battery holder(labled as U1). SCL is the clock input for the I2C interface and is used to synchronize data movement on the serial interface. 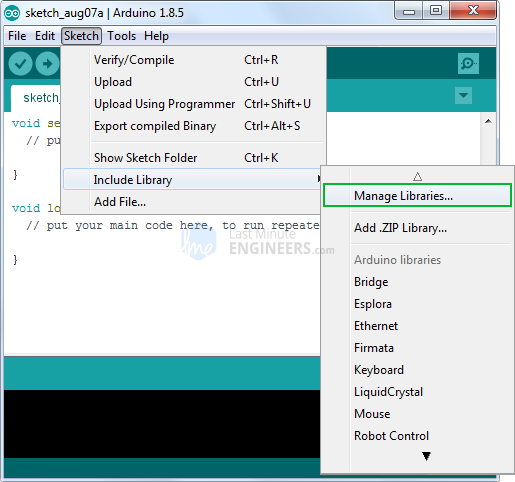 SDA is the data input/output for the I2C serial interface. VCC pin supplies power for the module. It can be anywhere between 3.3V to 5.5V. GND is a ground pin. BAT is a backup supply input for any standard 3V lithium cell or other energy source to maintain accurate timekeeping when main power to the device is interrupted. Let’s hook the RTC up to the Arduino. Communicating with a RTC module is a bunch of work. 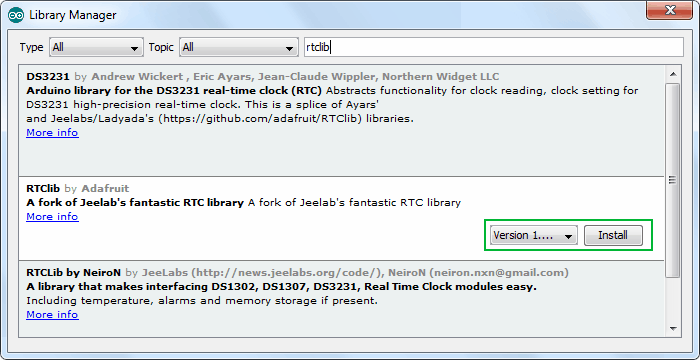 Fortunately, RTClib library was written to hide away all the complexities so that we can issue simple commands to read the RTC data. Filter your search by typing ‘rtclib’. There should be a couple entries. Look for RTClib by Adafruit. Click on that entry, and then select Install. 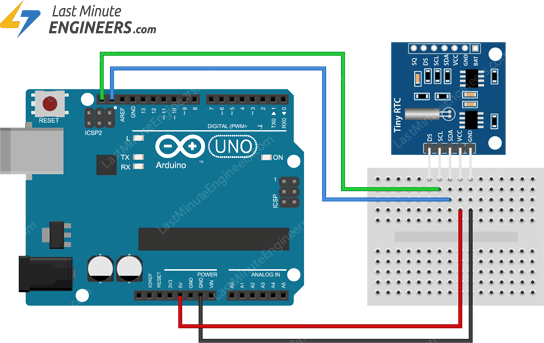 The following sketch will give you complete understanding on how to set/read date & time on DS1307 RTC module and can serve as the basis for more practical experiments and projects. // Comment out below lines once you set the date & time. Here’s how the output looks like in the serial monitor. The sketch starts with including wire.h & RTClib.h libraries for communicating with the module. We then create an object of RTClib library and define daysOfTheWeek 2D character array to store days information. In setup and loop sections of the code, we use following functions to interact with the RTC module. begin() function ensures that the RTC module is connected. 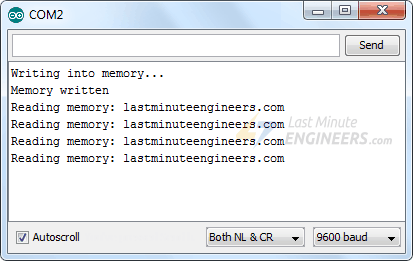 isrunning() function reads the DS1307’s internal I2C registers to check if the chip has lost track of time. If the function returns false, we can then set the date & time. adjust() function sets the date & time. This is an overloaded function. One overloaded method DateTime(F(__DATE__), F(__TIME__)) sets the date & time at which the sketch was compiled. 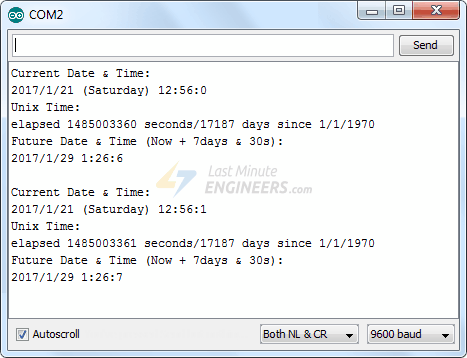 now() function returns current date & time. Its return value is usually stored in the variable of datatype DateTime. year() function returns current year. month() function returns current month. day() function returns current day. hour() function returns current hour. minute() function returns current minute. second() function returns current seconds. unixtime() function returns unix time in seconds. Unix time is a system for describing a point in time. It is the number of seconds that have elapsed since 00:00:00(known as Coordinated Universal Time – Thursday, 1 January 1970). TimeSpan() function is used to add/subtract time to/from current time. You can add/subtract days, hours, minutes & seconds. It’s also an overloaded function. now() + TimeSpan(seconds) returns the future time with seconds added into current time. now() - TimeSpan(days,hours, minutes, seconds) returns the past time. 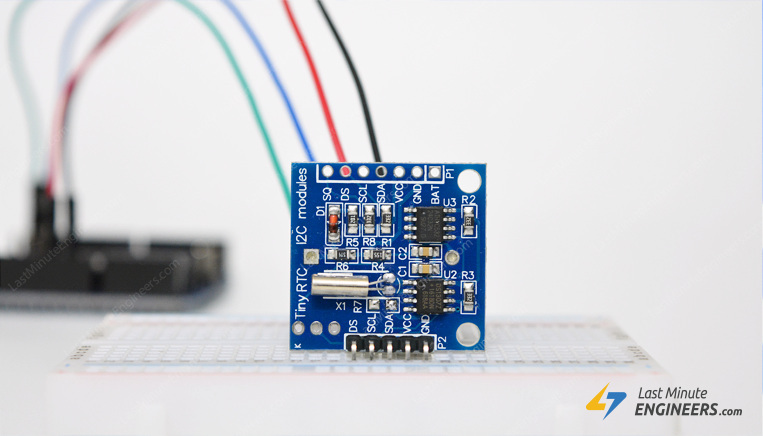 With DS1307 RTC module, as a bonus, you get 32 bytes of Electrically Erasable ROM. Its contents will not be erased even if main power to the device is interrupted. The following program writes and then reads a message from the 24C32 EEPROM. You can use this program to save settings or passwords or really anything.